The stone is right on the cliff tip, is where one has this beautiful view for photos. But beneath it there is a plateau where you can stand. Anyway, it’s risky, one misstep and you can go all the way down. Care should be taken, but gives to take super creative photos! 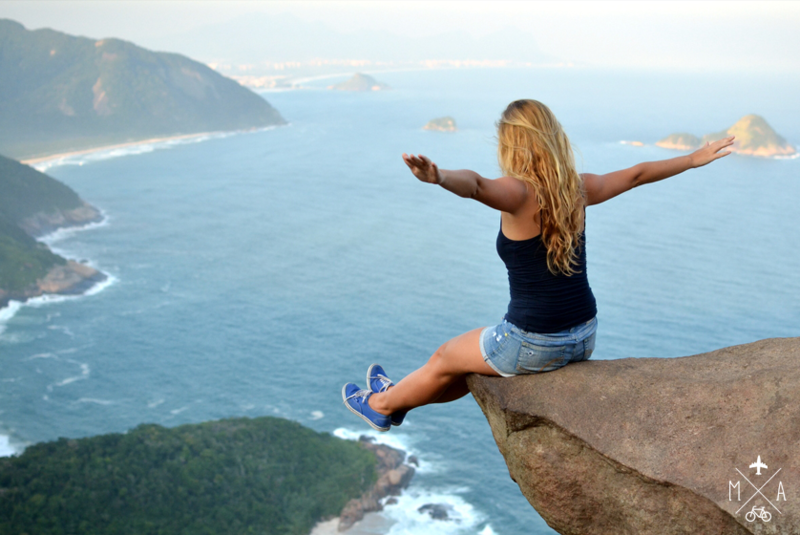 Looking at the horizon one can enjoy a little piece of Rio de Janeiro and its worth a visit! It is not very complicated to get there if you already know the Barra de Guaratiba area. If you do not know, use a GPS. The road that leads to Barra de Guaratiba is called Roberto Burle Marx. Along the road you will find restaurants with homemade food, seafood, etc… You go all the end to the end of this road, and you get to downtown Barra de Guaratiba. 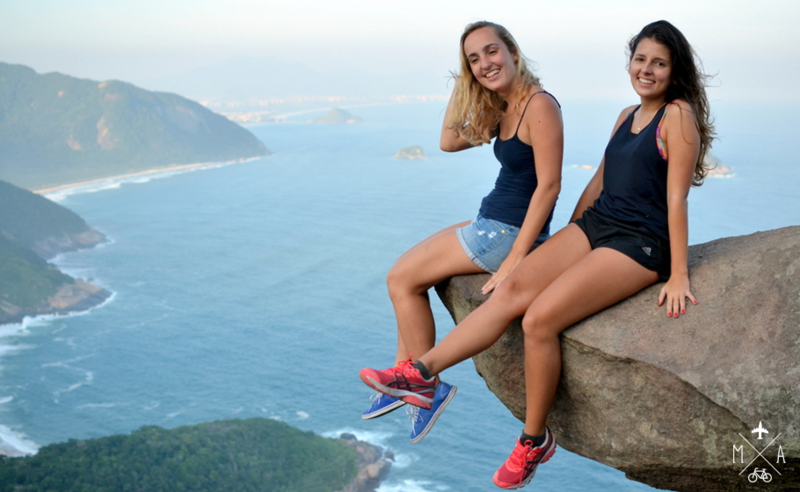 The hike to Pedra do Telégrafo takes about 50 minutes. According to O Globo, this girls had to wait 1h and 30 minutes to take her picture on a crowded day. – The traditional trail, which begins at Praia Grande (Barra de Guaratiba) from where you can take the Caminho dos Pescadores. From there, you need to climb a staircase leading to the Chapel of Nossa Senhora das Dores, until you reach the street Parlon Siqueira street, the steep slope that leads to the wild beaches of the area. – The other way, starts near the old bridge that leads to the Restinga da Marambaia, of exclusive use of the Army. The slope that leads to the trail is opposite to the site, and it is important to orient with the locals. Mototaxis go up 1/3 of the bike trail for R$ 7.00. The most famous spot, which has been highly publicized in social networks by people who were there, is not the highest peak. It’s just a huge sharp rock, where all are keen to take a picture. The impression one gets is that, under the rock, there is a fatal abyss. But no: the angle eludes because there is solid ground under the stone.